HMP Manchester has scooped the 2018 Excellence in Prison Libraries award for taking part in the Read Manchester BookBench project. In partnership with Wild in Art, the BookBench project saw schools and community groups decorate benches shaped like open books with their favourite literacy characters. The project encouraged both adults and children across the city to enjoy reading and raised awareness of the power of books to transform lives. The Chartered Institute of Library and Information Professionals (CILIP), which acknowledges best practice in prison libraries, recognised the library at HMP Manchester for it's participation in the BookBench project by presenting the team with an Excellence in Prison Libraries award. This award is presented to a creative project, a new service initiative or a collaborative activity with an external or prison partner which has had a lasting impact on both the prison library service and the wider prison community. A group of around 70 prisoners from HMP Manchester decorated a Read Manchester BookBench with designs from three literary titles - Great Expectations, Lord of The Rings and The Birds. Entitled 'Books Behind the Wall', the bench joined 57 others as part of a city-wide trail organised by Read Manchester. It was displayed at the prestigious Royal Exchange Theatre between July and September 2017 for families to visit and take part in literacy-focused activities. The bench is now back in the prison and has pride of place in the entrance to the education and library wing. The BookBench project encouraged prisoners to try reading new titles, get involved in discussions about books, and to expand their reading choices. As a result of the project, the prison developed a successful literacy-focused programme with children's illustrator, Nick Sharratt, who had not previously worked with prisoners. The prison also plans to be involved in the next city-wide art trail, Bee in the City. 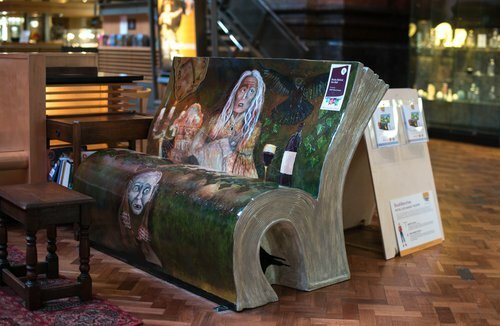 Take a look at all 58 Read Manchester BookBenches.